Grits. It’s more than just Girls Raised In The South. It’s more than just Kiss my Grits, the saying that the sitcom, Alice, made famous in the 70’s. It’s a southern staple. We serve this southern delicacy piping hot with eggs for breakfast and we gussy them up with shrimp for fine dining. You can find this southern favorite as a side dish at any proper southern fish fry. We salt and pepper them. We butter them. Growing up, I saw them covered in red-eye gravy. We’ve been known to throw an entire package of cheddar cheese into them. We’ve even experimented with gourmet cheeses . . . but served with sugar and/or milk? Why, you’ve blasphemed everything that’s holy about grits. Honey, if you want sugar, eat a doughnut and wash it down with chocolate milk (another favorite, but rarely eaten breakfast). I hear non-southern people speak of grits as an “acquired taste.” Acquired taste? Every baby south of the Mason-Dixon line was introduced to (and loved) them before they even had a swallow reflex. I mean, grits just slide down on their own. Decades ago, when my sister first moved to Colorado, my mom would have to mail grits (and self-rising flour) to her. I mean, a sunny side up egg must be mixed with something. All of that runny yoke has to go somewhere. You can find lots of varieties of grits: 5-minute, stone ground, slow cooking or microwavable packets. Grits are just ground corn that is boiled with water. That’s all. But to me, they’re part of my southern heritage. And just in case you missed my shrimp and grits recipe from last year, I’m sharing it one more time. It’s adapted from a recipe by Bobby Flay. And the only reason I’m referencing his recipe is because he’s married to a southerner. I doubt he learned how to make grits at culinary school. I betcha his wife taught him. Yep. That’s it. Rinse shrimp and pat dry. Fry the bacon in a large skillet until browned; drain well. Add shrimp to the bacon grease. Cook until shrimp turn pink. Add lemon juice, chopped bacon, onion and garlic. Saute for 3 minutes or until onion is translucent. Spoon grits into a serving bowl. Top with shrimp mixture. Sprinkle with chives. Serve immediately. Note: Sometimes I use the quick cooking grits (5 minute) and just follow the directions for cooking on the package. I grew up in the south but with Northern parents – so I didn’t get introduced to the wonder of grits until much later! Thanks for the recipe! I love Grits. The recipe looks fantastic. Hi! My name is Tiffany and I’m a grit blasphemer. Haha! I do love grits but I love them with melted butter and sugar. Yuuum. I can’t eat them unless they’re sweet. I may have to make this recipe for my husband though. This is right up his alley! 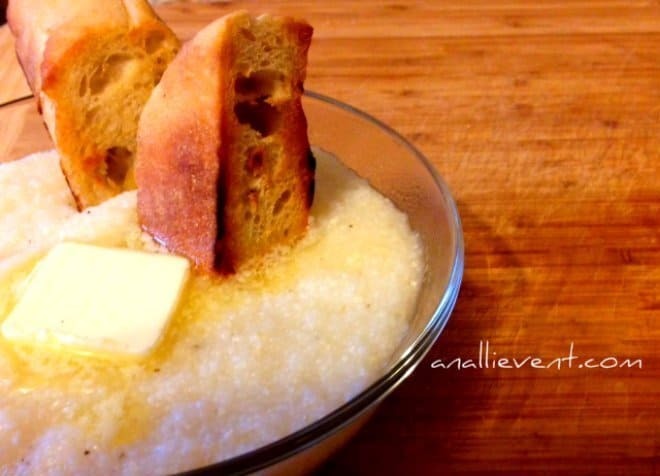 Confession: I was born, raised, and still live in the south and have never tried grits. I am almost ashamed to write that!!! I’ve tried the grit… just cant do it… maybe my taste buds will grow up soon. Funny because for this northerner it was an acquired taste! Now I do love them with shrimp and sausage. And I am a big fan of Bobby Flay! I’ll admit that I live in Georgia, but am not a fan of grits. However, my husband and his family love them, so I’ll give this recipe a try! Christine recently posted…A Sunday Ramble and Giveaway! Although born and raised in the South I think I’m the only person in my family who doesn’t eat them. They taste…gritty… to me. Lol!! However, I still have to buy them for Hubby & kids. He doesn’t allow me to cook them though. LOL! OMG Alli, you make me want some grits now! Thanks for the recipe and I’ll pin it for later! 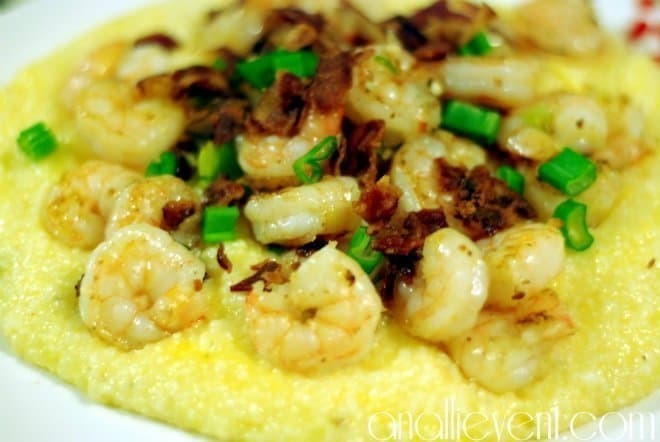 A good Shrimp and Grits recipe is priceless! Thanks for sharing. I’m Pinning to my Good Eats board right now! I do not have to tell you that i have never heard of Grits (so far away from the south ;)). Traditional recipes are the best! I was wondering if you had ever heard of them, Anna! They are so good! I like my grits on my hubby’s plate LOL (He LOVES all kinds of grits – I do not) Something about the texture, I think 🙂 I’m sure he would love yours, too! As a born and raised Canadian I’ve never had grits to the best of my knowledge. That being said I have boiled corn meal to use as a topping for a casserole… Is that anything like grits? Kinda, Sorta, Maybe. 🙂 Cornmeal is a lot finer than grits. You really need to try them and let me know what you think. LOL, LOL, LOL Alli. This post is so funny! I have to say, I have to acquire the taste – I have never heard of it until I moved to college in Puerto Rico. Not that Puerto Ricans eat grits, but there was a gal from Tennessee whose parents often mailed her grits (just like your mom did for your sister). My hubby likes it – he is American. I tried making the thing one time for him and you bet it did not turn out right? What’s a Caribbean girl trying to make grits for – definitely a Southern thing!!! LOL Alli! Amen, Sister! We lived in PA for 10 years and my mom (in GA) would bring me grits and self-rising flour…White Lilly of course. Thanks for sharing! Yes! It has to be White Lilly flour!!! I’m not a huge fan of grits.. I knooow, it’s a southern sin! I just can’t get past the texture, but my husband loves them so I’ll keep this recipe in mind 🙂 Stopping by from #‎tribedare‬! Madison | Wetherills Say I Do recently posted…A Stitch Fix Alternative // Exciting Blog News! I am not a grits person, even though i am southern, but you made me want to try them!